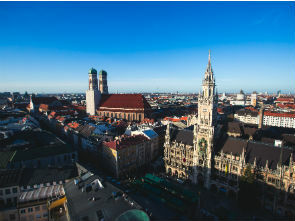 The Bavarian capital Munich is famous for its arts and culture, its comprehensive sports and leisure facilities, and its tolerance and joie de vivre. This is not only evidenced by convivial gatherings in beer gardens and the celebration of Munich's festivals, but also by a general love for good food, fashion and design. Munich is a liberal and safe city whose town council has included a representative of a lesbian & gay party for many years. The town hall throws open its doors and council rooms once a year for an event called "Rathaus-Clubbing" ("town hall clubbing"), which is the annual central party event of the politically motivated Gay Pride festival. Munich visitors can expect top class theatre, music concerts and opera performances. The scene congregates at numerous clubs and meeting places as well as traditional lesbian and gay events such as the street festival in Hans-Sachs-Strasse, Pink Christmas, or the Gay Sunday at the Oktoberfest.